For his birthday, Mr. Rosenberg received an Amazon Alexa from his sister. 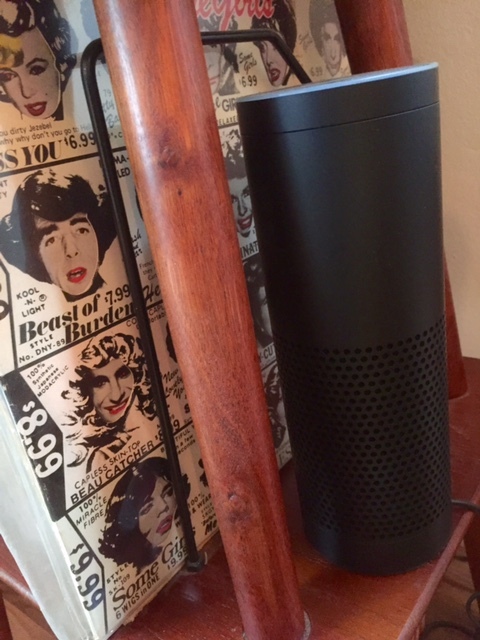 Alexa can best be described as a black cylindrical talking robot that responds to voice commands, answers general questions, plays music, and I'm sure a lot of other things. Bob: Alexa! Who is Mike Trout? Alexa: Michael Nelson "Mike" Trout nicknamed the Millville Meteor is an American professional baseball center fielder for the Los Angeles Angels of Anaheim of Major League Baseball. Bob: Alexa! Who was Jackie Robinson? Alexa: Jack Roosevelt "Jackie" Robinson was an American Major League Baseball second baseman who became the first African American to play in the major leagues in the modern era. Bob: Alexa! Who was Babe Ruth? Alexa: George Herman Ruth Jr., better known as Babe Ruth, was an American professional baseball player whose career in Major League Baseball spanned 22 seasons, from 1914 through 1935. Bob: Alexa! Who is Joc Pederson? Me: Bob, you already know the answer to all of these questions. Bob: I just want to know if she does. I have an Echo, who I've chosen to call Alexa. I can listen to just about any music I want, most radio stations, and it will instantly update me on sports scores and weather, as well as entertain me by answering some really inane questions.